Chico State presented its own brand of culture shock to Akinwande, now a senior in the social work and Multicultural and Gender Studies program. But he became involved in multiple clubs and activities, serving as president of the African Student Union and Associated Students’ director of university affairs. Moving from Africa to Inglewood in Los Angeles County was a painful change for Akinwande. Schooling for Akinwande was difficult because the British English he learned in Nigeria differs from American English. Akinwande finally started to receive the attention he needed in high school when he was placed in an English-learning class. Growing up in Inglewood, Akinwande said survival took precedence over education. Akinwande went on to discuss how his African-American heritage has deeply affected his outlook on life and experiences at Chico State, which have drawn him to leadership roles. Akinwande is pursuing a degree in social work and Multicultural and Gender Studies in order to help others in need. “I looked around and thought to myself, ‘The way my people are living is terrible,’ so I wanted to be that change and support,” Akinwande said. Coming to Chico State, the cultural upheaval continued for Akinwande, who again felt the help he needed to integrate as a first-generation college student was not provided. Akinwande says he was one of the lucky ones because he found a mentor. He could rely on her when he needed help, but most of his friends were not as lucky. When asked about Akinwande, Tonga said his experiences are shaped by his Nigerian background. Tonga said Akinwande’s Nigerian background, as well as being a young black man and the “first generation” to attend college, have set up obstacles for him at Chico State. 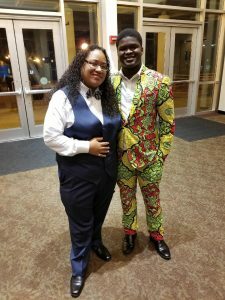 “There is a joke amongst me and my friends, that we cannot truly be ourselves on campus unless we’re at the Cross-Cultural Leadership Center,” Akinwande said. 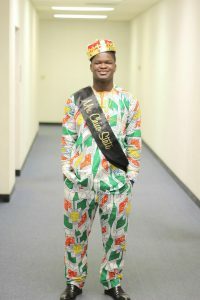 Akinwande, wearing traditional clothing, won “Mr. Chico State” honors at last year’s Black Hollywood Ball. No other spots on campus feel to Akinwande like the safe space the CCLC provides. It took Akinwande some time to find his place at Chico State. He feels most comfortable on campus with his black peers and black faculty and staff, who can relate to him and understand his struggles. Akinwande plans to obtain a bachelor’s degree next year and is considering pursuing a master’s degree. Eventually, he wants to return home and become president of Nigeria. Nicte Hernandez is a journalism major at Chico State. She wrote this article as part of a Tehama Group Communications team working with ChicoSol.